Young Scott Books, c1968, no other printings listed, 1st Edition, 64 pages. VERY GOOD to EXCELLENT Condition Hardcover with a VERY GOOD to EXCELLENT Condition Dust Jacket protected with a Mylar Cover. This book is ex-library with usual markings, slight sunning & very light wear. Pages & Binding are NICE & TIGHT! 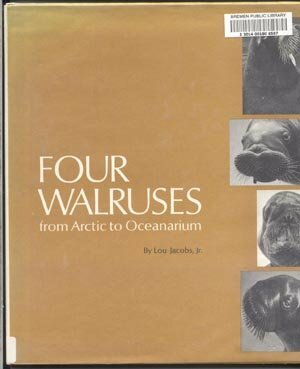 The true story of four walruses that were captured as babies in Alaska and raised to adulthood in an oceanarium in Southern California. Marineland of the Pacific is the oceanarium. FILLED with Pictures! See the story of Priscilla, Petula, Woofy & Farouk as they are raised in a domesticated setting.